Gov. Inslee proposes $54 billion 2019-2021 budget, a 22.3 percent increase. Plan includes a 9 percent capital gains tax. Gov. 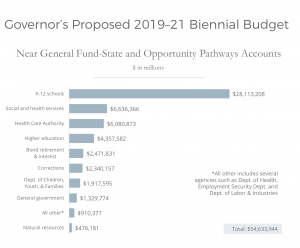 Jay Inslee today proposed his 2019-2021 biennial budget. We’ll be brief here.. There will be plenty of time to digest the details. Let’s start with four numbers: $54.6; 22.3, 9 and 2.5. They’re sure to attract a lot of attention.The first is proposed biennial spending; the second is the percentage increase from the current biennium, the third is the proposed capital gains tax rate, and the fourth is the governor’s proposed B&O tax rate for service businesses. 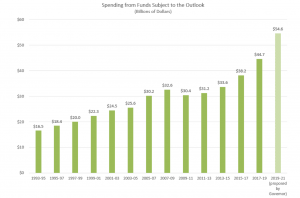 This graph from the budget office’s highlights document shows how the spending breaks down. …the plan would institute a 9 percent tax on some capital-gains earnings above $25,000 for individuals and $50,000 for households. Retirement accounts, homes, farms and forestry transactions would be exempt from the tax. About 1.5 percent of Washington’s households would be subject to it. The tax would raise about $975 million for the next two-year budget, and about $2 billion in future bienniums. Inslee would also boost the state business-and-occupation tax rate for services, which applies to professionals like attorneys and accountants. That current 1.5 percent tax rate would increase to 2.5 percent, raising another $2.6 billion over two years. One reason for the high maintenance level is that this is the first biennium in which the state’s response to the McCleary decision on school funding is fully funded for the entire biennium. This WRC graph makes clear the magnitude of budget growth, with the governor’s proposal included. It’s an ambitious spending plan, coming on the heels of significant growth and concerns the economy may be slowing. As the ST reports, the capital gains tax has been kicking around Olympia for a while, without ever breaking through. Republicans have griped about Washington’s expanding budget over the past several years and have strongly resisted a capital-gains tax, calling it unconstitutional and too volatile from one year to the next to be reliable. Democrats in recent years have sought it and other tax increases in an effort to make Washington’s tax system less regressive. There is no debate on this point – a capital gains tax is an income tax. This according to the IRS, every state revenue department in the country, and just plain common sense. The governor’s budget represents the opening bid in what’s likely to be an extended legislative negotiation. More later.